Question-1 :- In a cricket match, a batswoman hits a boundary 6 times out of 30 balls she plays. Find the probability that she did not hit a boundary. Let E be the event that she doesn't hit a boundry. Also check whether the sum of these probabilities is 1. Let E, F and G are be the event that 2 girls, 1 girl and no girl respectively. 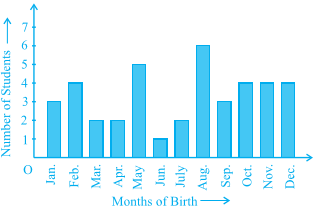 Question-3 :- In a particular section of Class IX, 40 students were asked about the months of their birth and the following graph was prepared for the data so obtained: Find the probability that a student of the class was born in August. Let E be the event that students born in the month of August. Question-4 :- Three coins are tossed simultaneously 200 times with the following frequencies of different outcomes: If the three coins are simultaneously tossed again, compute the probability of 2 heads coming up. Let E be the event that 2heads will comes up. (i) earning ₹ 10000 – 13000 per month and owning exactly 2 vehicles. (ii) earning ₹ 16000 or more per month and owning exactly 1 vehicle. (iii) earning less than ₹ 7000 per month and does not own any vehicle. (iv) earning ₹ 13000 – 16000 per month and owning more than 2 vehicles. (v) owning not more than 1 vehicle. (i) Let E be the event that earning ₹ 10000 – 13000 per month and owning exactly 2 vehicles. (ii) Let F be the event that earning ₹ 16000 or more per month and owning exactly 1 vehicle. (iii) Let G be the event that earning less than ₹ 7000 per month and does not own any  vehicle. (iv) Let H be the event that earning ₹ 13000 – 16000 per month and owning more than 2 vehicles. (v) Let I be the event that owning not more than 1 vehicle. (i) Find the probability that a student obtained less than 20% in the mathematics test. (ii) Find the probability that a student obtained marks 60 or above. (i) Let E be the event that a student obtained less than 20% in the mathematics test. 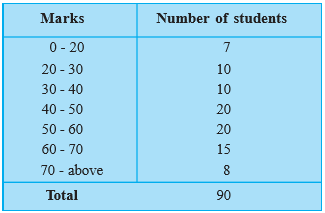 (ii) Let F be the event that a student obtained marks 60 or above. (i) Let E be the event that likes statistics. (ii) Let F be the event that doesn't like statistics. (i) less than 7 km from her place of work? (ii) more than or equal to 7 km from her place of work? (iii) within 1/2 km from her place of work? (i) Let E be the event that less than 7 km from her place of work. (ii) Let F be the event that more than or equal to 7 km from her place of work. (iii) Let G be the event that within 1/2 km from her place of work. Question-9 :- Activity : Note the frequency of two-wheelers, three-wheelers and four-wheelers going past during a time interval, in front of your school gate. Find the probability that any one vehicle out of the total vehicles you have observed is a two-wheeler. Question-10 :- Activity : Ask all the students in your class to write a 3-digit number. Choose any student from the room at random. What is the probability that the number written by her/him is divisible by 3? Remember that a number is divisible by 3, if the sum of its digits is divisible by 3. Find the probability that any of these bags chosen at random contains more than 5 kg of flour. Let E be the event that any of these bags chosen at random contains more than 5 kg of flour. you were asked to prepare a frequency distribution table, regarding the concentration of sulphur dioxide in the air in parts per million of a certain city for 30 days. Using this table, find the probability of the concentration of sulphur dioxide in the interval 0.12 - 0.16 on any of these days. Let E be the event that the concentration of sulphur dioxide was in the interval of 0.12 − 0.16. A, B, O, O, AB, O, A, O, B, A, O, B, A, O, O, A, AB, O, A, A, O, O, AB, B, A, O, B, A, B, O.
you were asked to prepare a frequency distribution table regarding the blood groups of 30 students of a class. Use this table to determine the probability that a student of this class, selected at random, has blood group AB. Let E be the event that students having blood group AB.